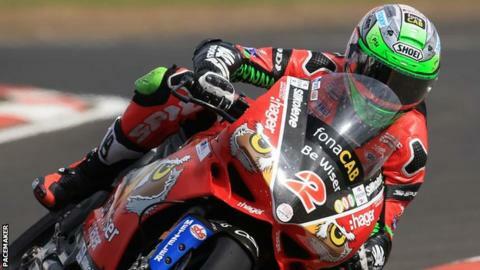 Carrickfergus rider Glenn Irwin secured third place in Sunday's British Superbike opener at Silverstone. Irwin was second in Saturday's race and added a fourth in the weekend's final race to lie fifth in the series to make the end-of-season Showdown. Alastair Seeley won the British Supersport sprint race on Saturday but was fifth in Sunday's feature race. Josh Elliott came in second in Sunday's 1000cc Superstock race with fellow NI rider Keith Farmer third. Fermanagh man Elliott, who won part one of Saturday's race, is fourth in the standings while Clogher's Farmer is joint second and just 3.5 points behind Billy McConnell. Glenn Irwin goes into the final three rounds 52 points behind Leon Haslam, who won all three races at the English circuit. Andrew Irwin was ninth in race two to follow his 11th-placed finish on Saturday. Seeley won on Saturday on his his return to the EHA Racing Yamaha team but had to settle for fifth in a feature race won by Benjamin Currie. In the Moto3 class, Carrickfergus teenager Scott Swann took his first British Superbike win. Swann, 15, had earlier qualified in pole position for the first time at Silverstone and held off Spaniard Victor Rodriguez to win by just three-hundredths of a second.